Just like other creatures, iguanas are not immune to the disease. Iguana could become ill and require treatment in order to recover as usual. Some diseases can threaten the lives of iguanas that require further treatment by a veterinarian. This disease appears due to poor nutrition and food. If the first time to maintain the iguana, it's good to get advice from the seller regarding suitable food for iguanas. Some foods such as lettuce does not contain many nutrients. So it is important to combine the kind of food iguana. These conditions will be exacerbated when the iguanas do not get enough vitamin D3 intake so that the body can not produce enough calcium. Symptoms of this disease include the face and lower jaw that looks soft, swelling in the lower jaw, fatigue, leg swelling, and difficulty eating. The disease is caused by a deficiency of vitamin B1. 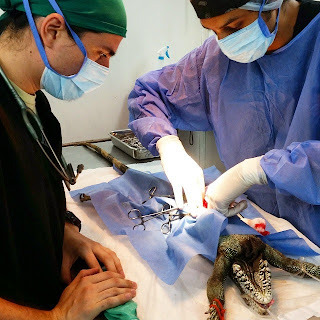 To cure this condition, the vet will usually inject vitamins and minerals as well as recommending changes to feed iguanas. When not feel comfortable in his new environment, iguana will try to escape from the cage, causing scratches and abrasions to the nose and face. When searching for a way to escape they usually rub his nose in the cage, causing blisters. If the blister is not dealt with, bacterial infections or ulcers can occur.